Wood Dowel Jig - Dowel Wizard is a quick and easy-to-use wood dowel jig. I would like to introduce you to a new and uniquely different type of wood doweling tool. I’m sure you’re familiar with the other types of doweling jigs that are on the market these days. Out of frustration over years of wood working using these tools, I developed this new wood dowel jig. After you’ve reviewed the information about this new doweling tool, I believe you’ll want one for your shop. 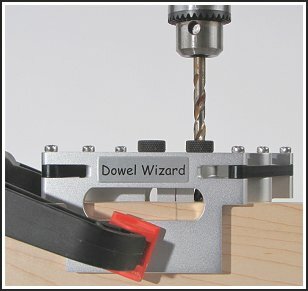 The “Dowel Wizard” is the most straightforward, quick and easy-to-use wood dowel jig you’ll ever use. The Dowel Wizard was created for woodworkers who want to easily and quickly locate and drill wood dowel holes accurately and repeatedly, without a lot of fussy adjusting which is necessary with most of the wood dowel jigs available today. This tool is made of strong light-weight anodized aluminum that folds up and easily fits in your apron pocket. It’s a very simple design concept based on an old principal that automatically centers the dowel holes on the board and positions the two dowel holes at one setting exactly spaced one inch on centers. When using this tool, the mating pieces align and fit perfectly together every time. Click to See the Dowel Wizard in Action! holes on one inch centers. Clearly visible alignment line indicator. Tool automatically centers the dowel holes on work piece. Light weight, compact, fits in shirt or apron pocket. Made of strong aircraft anodized aluminum. Clean out slots to prevent buildup of drill shavings. Interchangeable harden steel drill guide bushings. Searching for “wood dowel jig”? Dowel Wizard is an easy-to-use wood dowel jig at an affordable price!